Unable to leave a rating — 10 stars! Me neither. I also give it 10 stars.. BUT it’s exactly what i said to a liberal the other day. 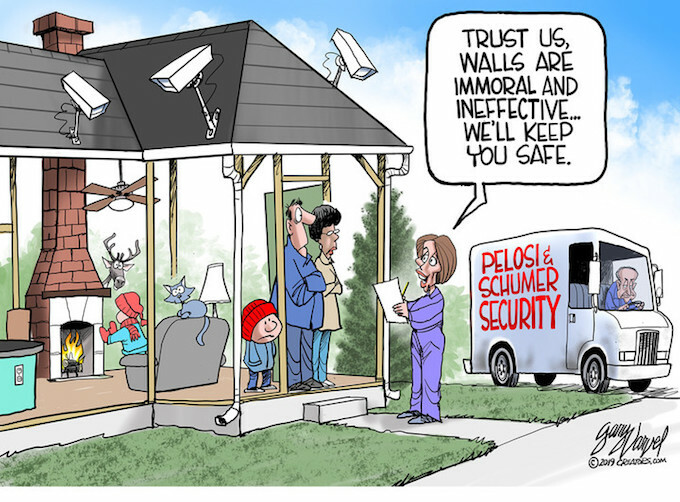 IF walls are immoral, why have them on your house! His response “But i need them to protect me and my family”.. Typical libtard. Wanting to protect their own, but caring not about the rest of us. What has happened to our ability to vote? It just seems to be the cartoon thread where the votes don’t work. I noticed it wasn’t working yesterday, either! Under the Health and Safety laws that would be hazardous to US. and we may hurt ourselves. When you have convicted criminals you put them behind ________ . You put them behind bars and/or walls. Trump wants to build a Wall. Some of that Wall will have have slats (a form of bars) so we can see people on the other side. Show me one prison anywhere that doesn’t use walls or bars. Just one. Just one anywhere. You can’t. In the entire history of prisons, not one has NOT HAD ANY walls, or slats for bars..